Following SMACC 2013 in Sydney I was fortunate enough to spend a day with the team at Ambulance Service New South Wales’ Great Sydney Area HEMS based at Bankstown airport. If you have not discovered this fantastic group of clinicians before then you should. They have an excellent website here which includes some super learning materials, resources, videos and blog posts. If you are interested in pre-hospital care then it is a must visit site. You can also see an introduction to a new TV show about the service here. 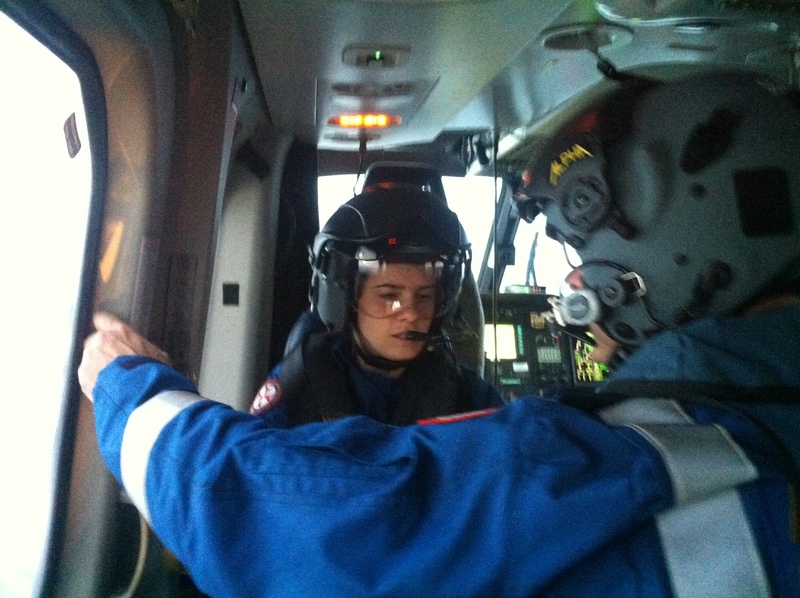 So, a day with the HEMS team – what’s the point of that then? Well, in some respects I quite fancied being Cliff Reid for the day as if life had been different I would like to think that I might have achieved what he has done, but despite some early career similarities we have taken different paths.. More seriously it was an opportunity to look at a very different trauma system to the one we have in the UK. I think it’s really important to look at different systems as that is a huge opportunity to open your eyes to things that you don’t know you don’t know about, the unconscious incompetence or the Donald Rumsfeld principle if you prefer. Seriously though, it is far too easy as a clinician to just look inwardly at your practice and not challenge yourself to look at what others might be doing better than you. If you are a regular helicopter clinician some of this will be old hat – don’t complain – reiteration is no bad thing…. So, two great reasons – firstly to have an interesting day and secondly to try and learn something! 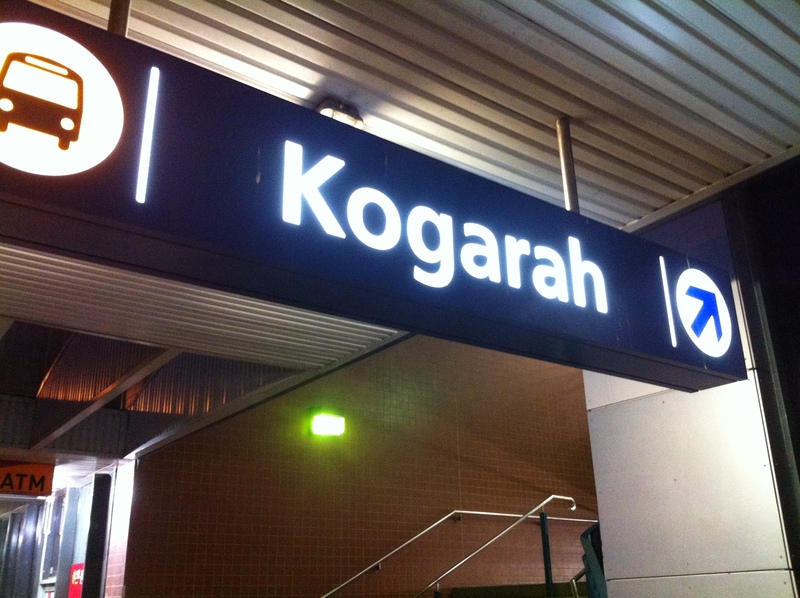 After a very early start to the day (0500) I made it to Kogarah where I was met by Ruby from the retrieval service. 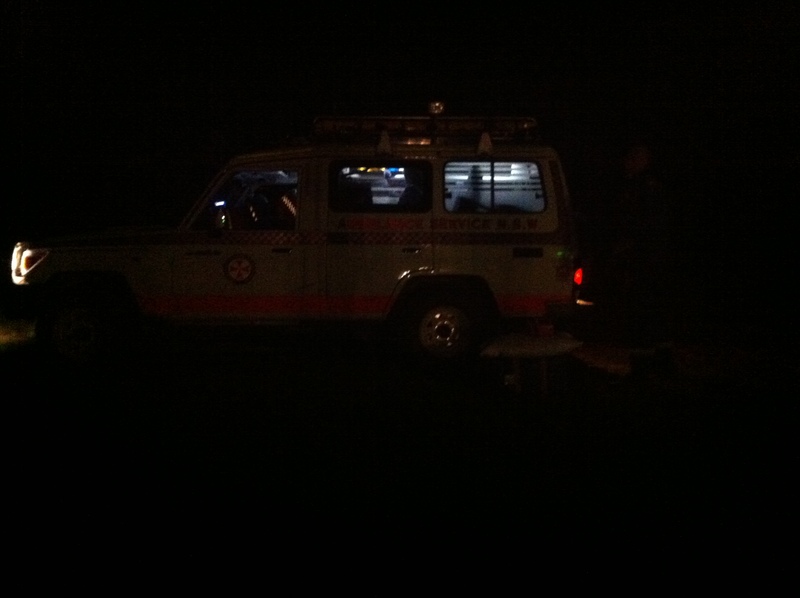 Issued with kit, met Felicity (doc) and Bubba (paramedic) transferred to the airport and safety briefed on the aircraft…. Shifts are 12 hours long and change over at 0730 and 1930. 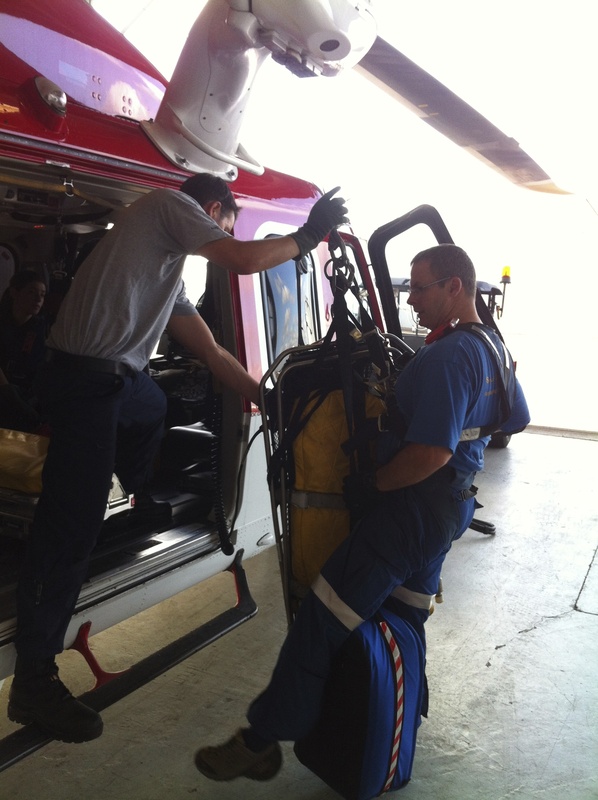 The teams work together for the shift and are multidisciplinary. The day starts with a brief that all attend (paramedics, pilots, docs etc.). This is checklist led and encompasses things such as weather, aircraft, observers (i.e. who was I, name, experience, what I could/could not do (e.g. no winch ops)…), kit, training etc. We were the only helo on that day so it was looking likely that we would be busy. This was interesting to see. We have recently introduced formal handovers in the ED back home, but they are doctor centred and focused on clinical cases rather than overall departmental issues, there are reasons for that, but it did make me think again about whether we should integrate handovers in the ED in a similar way. Staffing, training, kit, cases are multidisciplinary problems back home so why do we not integrate handovers (learning point 1 for the day). All emergency care has a degree of unpredictability and this is particularly apparent in helicopter operations as they are only tasked to specific roles, so there was a fair but of waiting around in the morning. This time was not wasted as it was used to practice winch rescue in the hangar. Most winch operations are conducted by the paramedics (who have been on the service for a long time) rather than the docs who rotate through much more frequently. The training consisted of a talk through/walk through process with all parties (para/doc/winchman) going through each individual step of the process. Again, this was aided by checklists carried by the crew and also printed on the inside of the cabin. The training was a requirement for all, even the very experienced paramedics had to repeat the training on a regular basis for sign off. Educationally this worked in my opinion as the team trained together, going through the process both mentally and practically, in situ and with the correct kit. Again, a good example of training as a team and in the right environment, something that we should again take note of back home as we don’t do this. Why is this different?? Arguably in the UK most training is typically done from seniors to juniors (seniors don’t take part – they teach), training happens somewhere else (not in the environment we work in), training happens in silos (is not multidisciplinary). In situ simulation has to be a way forward for us (learning point 2) – and thankfully I have plans in place to do this when I return to UK, but we need to do a bit of catching up. The helicopter was tasked several times throughout the day. Initially the jobs were either cancelled before we arrived or were potential winch jobs (so I was not allowed on). However, in the afternoon we were tasked to a job on the other side of the Blue Mountains. Obviously, no mention of patient details here, but suffice to say that it was a primary trauma retrieval. What surprised and shocked me here is the impact of distance on health care in countries like Australia. Tim Leeuwenburg referred to this as the tyranny of distance at SMACC 2013 and you have to experience it to realise what a vast place Australia is and how that can impact on healthcare. So even with a long flight we arrived soon after the local intensive care paramedics who had done a fantastic job packaging the patient and moving them to an area where we could land. 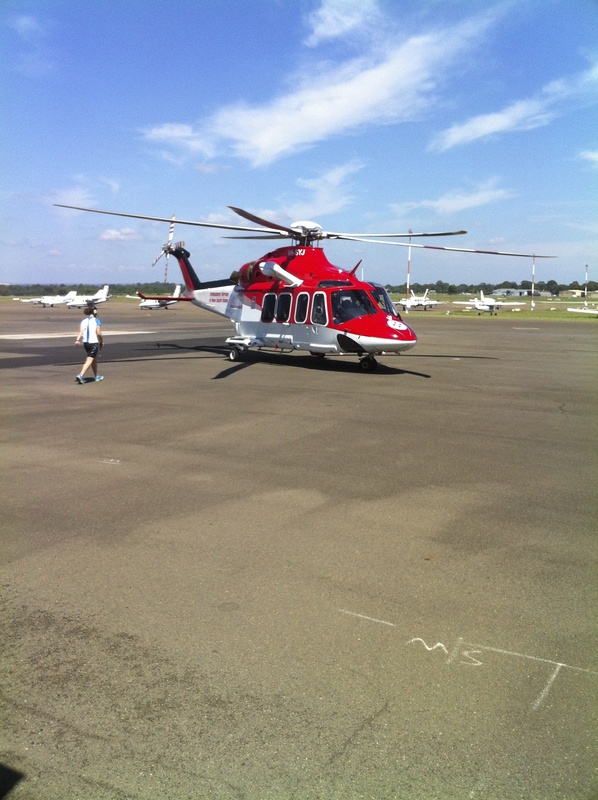 We then had the first handover of the day between the ground paramedics and the helo team. This followed roughly a MIST process, was slick and to the point. What was noticable was that everyone ‘listened’. The handover was given to the team, listened to, clarified and repeated where necessary. Learning point 3 – handover is a two way process – listening is just as important as giving. Handover complete we were then off to the Liverpool hospital in Sydney where again we handed over the patient to the trauma team. This felt more like home to me with a busy resus room and a team assembled to receive the patient. It was a little unclear who was in charge at first as uniforms and labels were absent although the receiving team appeared to know who was who. Again, a structured handover was given by Felicity (very well if I may say so) whilst we transferred the patient over. As before, this handover was characterised by active listening (learning point 3 again). We were then off back to base for the next job and I was left wondering what happened to the patient? What injuries did they find? Was the negative prehospital USS for pneumothorax confirmed? 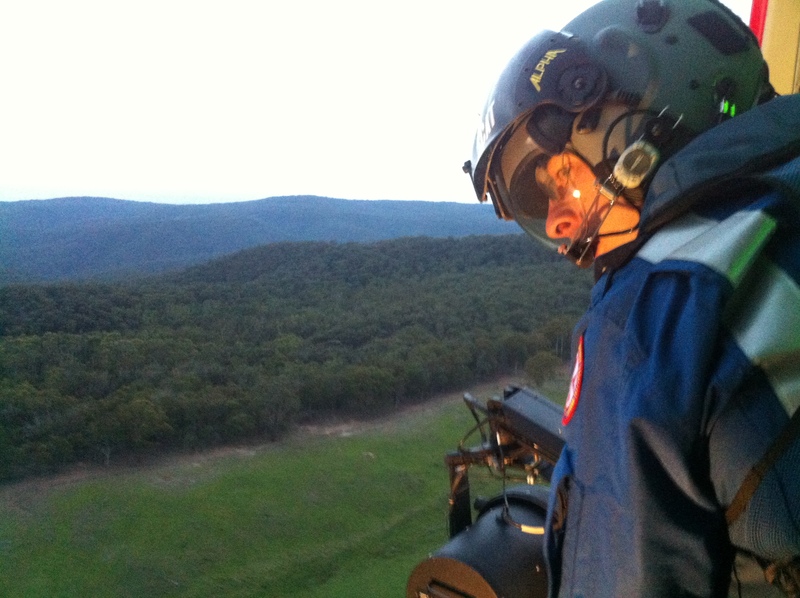 Lots of questions really….. at Sydney HEMS they follow patients up to find out what injuries they sustained and how they got on. I would not have this opportunity and it made me stop and think about paramedics back in the UK who do not have good mechanisms for clinical feedback. Learning point 4 – think about better ways to feedback to prehospital teams in UK. The next job was even further away and was in the middle of ‘the bush’. After a 20 minute technical delay for take off, then a 50+ minute flight we still arrived shortly after the paramedic crews in rural Australia. Landing at a small airstrip (after a bit of search) we then traveled on the back of a small truck/quad bike to the patient. Again, a good handover from the local paramedics (who had driven 70km to get to the patient! ), our assessment, packaging, USS, analgesia and back to the helicopter for transfer back to Sydney.By the time we had arrived, assessed and packaged it was dark and again another learning point is to realise just how tricky assessments are in difficult environments (learning point 5). It also reinforced the ‘tyranny of distance’ effect of trauma in rural communities. In the UK we consider hospitals such as Scarborough (home of the wonderful St.Emlyn’s contributor Andy Volans) to be remote, perhaps we do not realise just how lucky we are. No patient details here except to say that we used a lot of ketamine to facilitate the transfer back to St George in Sydney via a refuelling stop along the way (Australia is very, very big). I was spotted and rumbled in the resus room at St. George by Tamara who had been at the SMACC conference…. After SMACC I believe that the standard unit of Ketamine dosing is 1-Minh….., and I think we used about 3.5 Minh’s on this trip! Perhaps the most rewarding aspect of the day was to witness the interactions between paramedics, docs, flight crew and ground staff. There are hierachies here. I suspect if that I sought out the regulations it would state that the flight crew control the aircraft, docs are in charge of complex clinical care, paramedics in charge of environment, but these are expertly created in rather subtle ways such that all members of the team are engaged in all aspects. The briefing at the beginning of the day sets the scene, but in practice the role of leader changes as events dictate in a way that is both informal and explicit. It was very much an observation of an effective team with really good communication between everyone, but especially between Felicity as doc and Bubba as paramedic. As paramedics stay with the service for longer periods of time they can apparently act as the ‘organisational intelligence & memory’ for the service. Doctors may only fly on 6 month attachments, but with different and more advanced clinical skills. This reminded me very much of my time with the military, noting the similarities in the relationship between a junior officer and their senior sergeant. Whilst both have their roles and expertise the unit only works well when both respect and value each others contributions. It’s difficult to encompass this feeling in a post but I was impressed at the way Bubba made things happen in a safe and smooth fashion with apparently little effort (but clearly lots of skill). Felicity fitted into the system well guiding clinical management and taking the lead for hospital handover. Now I cannot say whether I just happened to fly with two great clinicians or whether this is evidence of great training, but it was impressive to witness. I also saw similar interactions with other teams later in the day so I suspect that this relationship is embedded in the service. So thanks to everyone for a really interesting day that was both fantastic fun and also really informative. It made me question a number of things that we do back home and I will do my best to emulate some of the learning points identified above. I would like to thank everyone for allowing me to fly (particularly after SimWars) and to name but a few…., Martin, Ruby, Tim, Cliff, Oli, and everyone else. In particular to Felicity and Bubba who extoled the behaviours and characteristics that define clinical excellence. Thanks again, and if this has made you think about a retrieval job in the wonderful city of Sydney you will be pleased to hear that they are recruiting. If it wasn’t for age, dodgy knees and a great job in Manchester I think I might even apply myself. Seriously though it’s a great job in a great city, here is the link for applications. Glad you had a good time in Australia – and great post, clearly a lot for all of us to learn from a mature retrieval service like GSA-HEMS. I increasingly believe that we can all learn from visiting others. As we get more senior and older (the two are different) it’s so easy to get entrenched in our ways. Much better to get out there and look at what others are doing. I always learn something by seeing others work…., this trip was exceptional but I am wondering whether I should do this every time I go on holiday??? I’ll give a talk/workshop/lecture in payment for a half day of experiencing EM in a different healthcare system..
‘Travels with a talk’ – a project I’d love to put together. Great stuff Simon. Good Handovers and checklists a must for all EDs/ICU but rarely done. What a job. Yep, Liverpool and St. George were both excellent. Thanks for those links on handover. We have put together a similar system back in Virchester but it is still evolving.